Whether you drive or ride, the way you get around downtown San Jose is about to change. New, safer bike lanes are on the way, with the city spending big to try to cut down on cycling fatalities and clean the air. The price for drivers: It could be harder to park your vehicle. Existing bike lanes in downtown San Jose force bicyclists to get close to both moving and parked cars. The new plan would give everyone more room. Joseph Robinson started biking to work in San Jose five months ago, so safety is on his mind, as it is for most cyclists. "You have to watch for speeders who will run some lights," Robinson said. 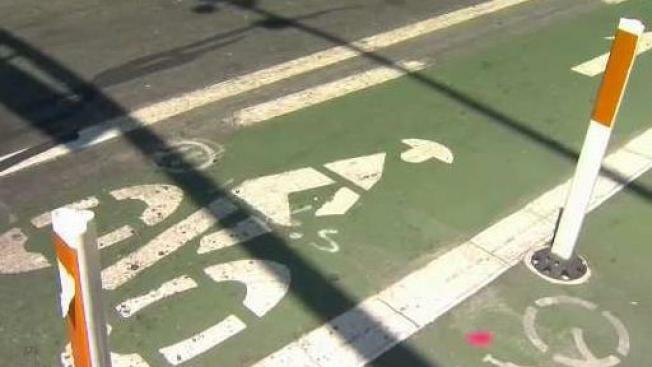 San Jose city leaders have a $1.5 million plan for new bike lanes from downtown near San Jose State extending into Japantown and toward SAP Center. "If they feel safer, I think they'll be more encouraged to actually ride their bicycles instead of getting in a car and causing more traffic congestion," City Councilman Johnny Khamis said. Part of the new plan has parked cars outside of bike lanes, creating a barrier between bikes and traffic. "I would love it," one cyclist said. "The cyclists would come out more and more because they'd have their own lanes." The city says the lanes should be ready sometime in 2019, but there is a tradeoff: There will be 80 fewer parking spaces downtown.